STEB solar hot water heaters, with volumes of 200, 300, 600 and 800 litres, are engineered for heating and accumulation of domestic hot water using solar energy, for additional heating with a boiler and for alternative heating using the internal electrical heater. The water heaters are made of stainless steel, which guarantees a high level of hygiene. Extensive application of modern technologies and fully tested technical solutions, enable economical use of all available energy sources. A special feature is an integrated automatic solar controller which controls and connects the use of all the previously mentioned energy sources, integrating them into an automatic process. Manufactured in accordance with ISO 9001 and ISO 14001. They are intended for heating and accumulating DHW using solar energy. The boilers are made of stainless steel, guaranteeing high hygiene conditions. Modern solar automatic control, which takes care of proper and safe operation and economical use of available energy sources. The insulation layer of mineral wool on Al-foil 80 mm thick effectively protects the boiler from heat losses. 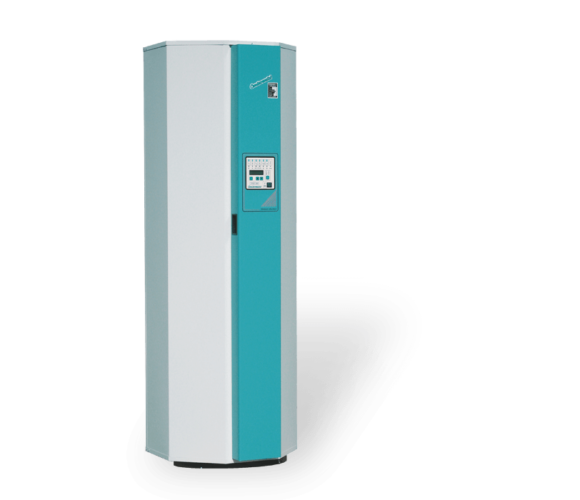 STEB solar hot water heaters, with volumes of 200, 300, 600 and 800 litres, are engineered for heating of domestic hot water with solar energy, with a boiler and for alternative heating using the internal electrical heater. They are made of high quality stainless steel, which guarantees high hygiene standards. A modern automatic built-in solar control system allows regular and safe operation and economic use of all available energy sources. Automatic control also offers the possibility of reading individual specific temperatures through a special illuminated display. Pipe connections are located on the rear side which enables simple and fast connection into the heating system. Pre-wired electrical connections and sensors. Thermal insulation made of glass wool on 80 mm aluminium foil effectively cuts heat loss. Domestic hot water temperature regulation. 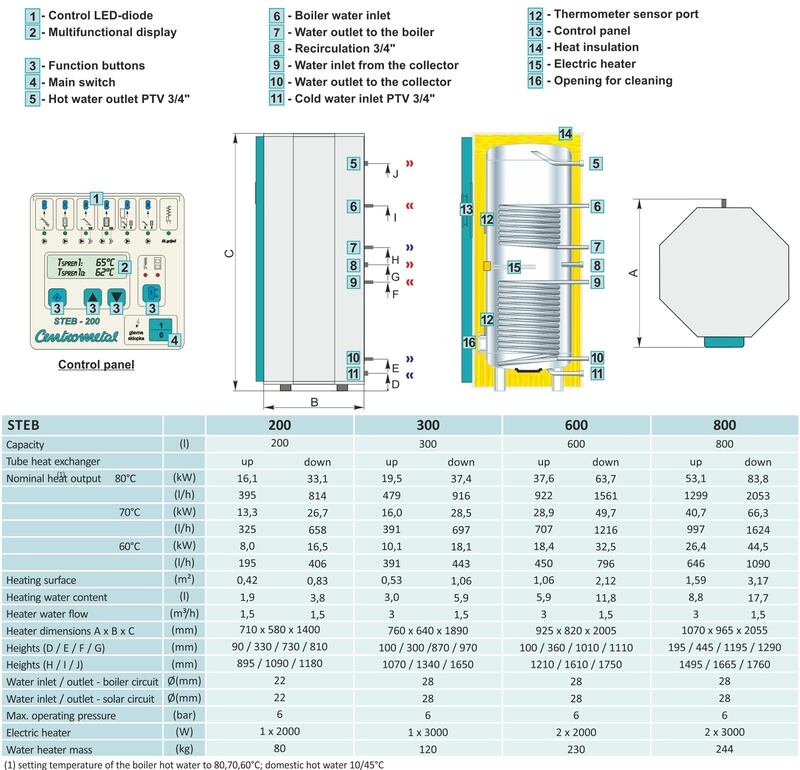 Regulation of the solar collector circuit (max. two separate collector circuits). Regulation of the boiler circuit (max. two circuits: firing circuit with oil, gas or solid fuel (bio-mass fuel) and boiler circuit firing with solid fuel (bio- mass)). Controller of the additional accumulating hot water heater (i.e. TB hot water heater or CAS) – an additional sensor is needed. All previously mentioned control functions can be performed through circulation pumps or mixing valves. Regulation of the electrical heater. Circulation pump over-heat safety system. Readings of all relevant temperatures on an illuminated display. Display of solar energy quantity in kWh. LED display shows operation of individual system elements.